So you've got a broken vent window and you need to save the vent window frame... Now what? There are no vent window frames available, and the ones on the truck aren't "terrible", so really you could get by with the existing equipment if you could just replace the glass. But how do you get the glass out of the frame? You could call the glass company. They would be more than willing to help you out, and charge you for it. You could check the forums for repair ideas...but that's probably why you're Googling it right? "break the window and then dig it out"
Are those your only choices? No. We found a much easier solution than breaking the glass and leaving a mess behind OR paying the glass company. Classic Auto Repair: Who Do You Trust? If you need a mechanic for your classic car, who do you call? It's not the dealership. Our customer's have trusted us with their investments, family heirlooms and childhood dreams. The next time you need mechanical repairs on your classic car or truck, call someone you can trust! We promise, we won't leave swirl marks in the paint, or grease on the upholstery. We know what that vehicle is worth, both in dollar value and history. 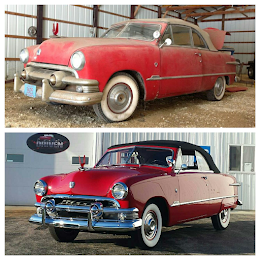 This video features some of the wide variety of cars and trucks that Driven Restorations has had the opportunity to rebuild and enhance over the years we have been in business. Some are fully original restorations, while others are "built to order" for performance. If you need to replace the weather stripping or seals on your windows in a 1970 B-Body Mopar, and you're wondering how in the world the vent window fits back in the door properly, there is little hidden trick. There is a screw behind the rubber on the vertical vent window channel. When the screw is removed, you can pull the vertical piece of the vent window outward, just enough, after the whole assembly is in the door, to allow for installation of the door glass and glass guides. See photos below. 1. All glass and trim removed from the car. The vent widow was cleaned and inspected. This car, a 1970 Roadrunner, received all new glass channel run, felt, glass guides, hardware, and weatherstrip. You will need a phillips head screwdriver and likely PBR or WD40 to get the screw to loosen.